When the concentration of CO2 is low the rate of photosynthesis is also low. (the plant has to spend time waiting for more CO2 to arrive). Increasing the concentration of CO2 increases the rate of photosynthesis. Place a pond weed Elodea upside in a test tube containing water at 25°C. Place the tube in a beaker of fresh water. 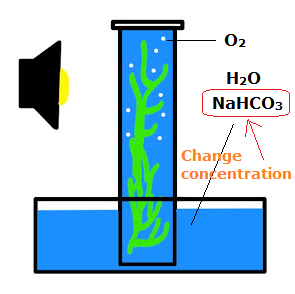 Place excess sodium bicarbonate (NaHCO3) in the water to give a constant saturated solution of CO2. Place the lamp (the only light source) at a fixed distance from the plant. Maintain the room temperature at 20°C. Count the number of oxygen bubbles given off by the plant in a one -minute period. This is the rate of photosynthesis at that particular concentration of CO2. The gas should be checked to prove that it is indeed oxygen - relights a glowing splint. Repeat at different lower CO2 concentrations by using different dilutions of a saturated solution. 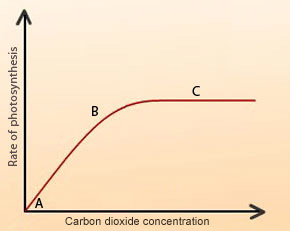 Graph the results placing CO2 concentration on the x-axis. The rate of photosynthesis increases linearly with increasing CO2 concentration (from point A to B ). The rate falls gradually, and at a certain CO2 concentration it stays constant (from point B to C). Here a rise in CO2 levels has no effect as the other factors such as light intensity become limiting.